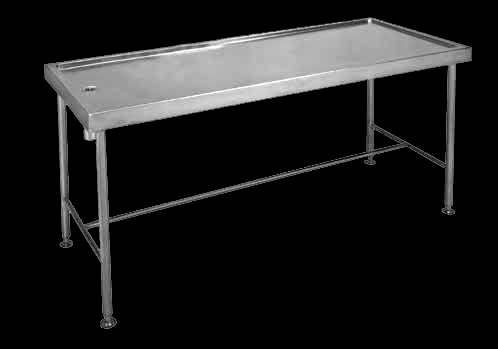 Post Mortem Table (Franke Model MT) 1980 x 765 x 900 mm high manufactured from grade 304 (18/10) stainless steel gauge 1,6 mm thick. The top slab constructed with 30 mm deep recess all round with a built in fall towards the 40 mm waste outlet. The underside is sprayed with vermin proof bitumastic sound deadening and supported with a 30 x 30 x 3 mm framework and galvanized mild steel backing sheet. The post mortem table is fitted on to four 40 mm stainless steel legs and cross braces and each leg is fitted with an adjustable foot piece. This unit fixed 900 mm high from the top of the front apron to the finish floor level with anchor bolts (bolts specified elsewhere). Optional Fittings: Cobra Model 519- 21 15 mm elbow action trigger control hand shower set.